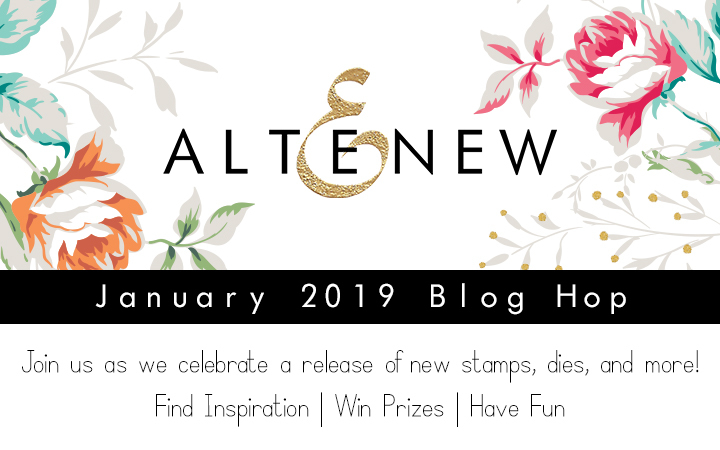 The wonderful Altenew January release is here! You should have arrived here from the lovely Heather's blog! For lack of time, I'm going to keep this post short, because I've made quite a few projects. If you have any questions on how I made something, please don't hesitate to ask! Alright, first up is the wonderful Radial Heart die. I die cut this from white card stock as well as from a few different patterned papers from the Pastel Dreams pad. I then pieced the hearts back in, alternating between papers. I used the Simply Friend die for my sentiment. I die cut this a bunch of times and stacked them for a dimensional look. I added an organza ribbon bow to finish my card. Next up is the All the Hearts die set. 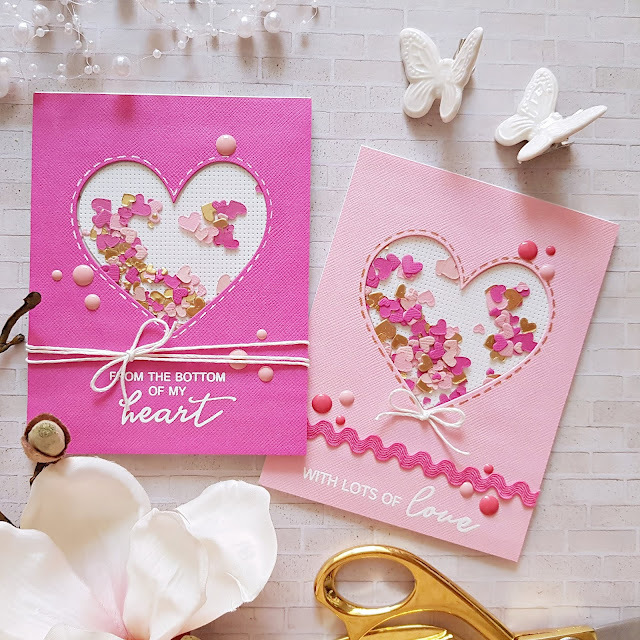 I created two shaker cards filling them both with the tiny little hearts you can cut with these dies. These sentiments are from the All the Hearts stamp set and I just white embossed them. The next two cards I made with the All the Hearts stamp and die sets. 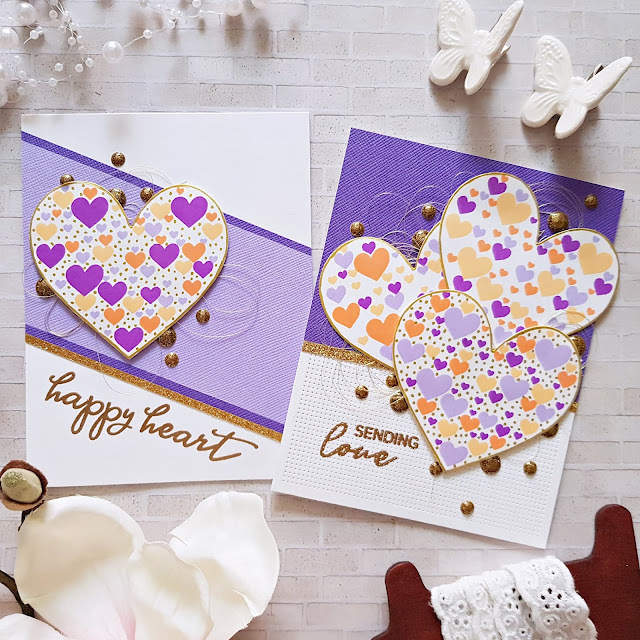 I stamped all 4 hearts at the same time, switching between colors, all shades of orange and purple. I added various little gold accents: embossed sentiments, enamel dots, metallic thread and glitter paper. On the next two cards I used a bunch of different sets: All the Hearts stamp and die sets, Angelique Motifs stamp set and the Angelique Motifs mask stencil. This stencil is a new product, it comes with little die cut pieces which you can use to mask your images. These stencils are thinner than the standard Altenew stencil. However, I didn't do any masking here - I just used the stencil the traditional way and added modelling paste to one of my cards. Next up, the Stained Glass Window stamp and die sets. This is such a versatile set, you can stamp the flowers many different ways. I went with the stained glass look on one and just good old simple stamping on the other. 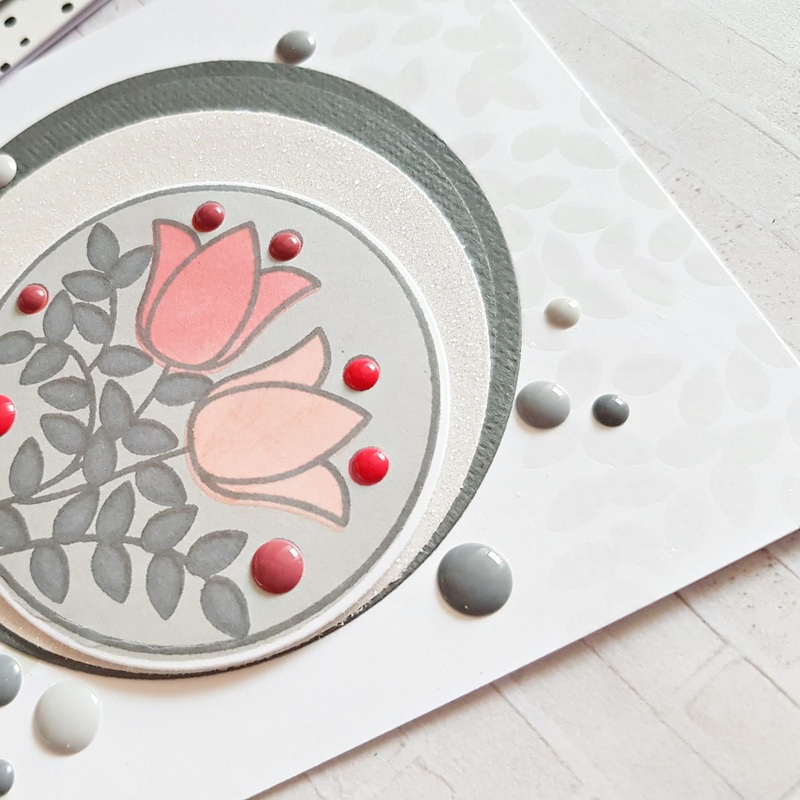 For one of the cards I used patterned papers from the Pastel Dreams and Verdant Walk paper packs to create the background. For the other one I used a stamp from the Stained Glass Window set - I partly stamped and partly embossed this panel. Last but not least, some projects with my favorite product of this month, the Hibiscus Garden 3D die set. On my first card, as well as the 12x12 layout, I used papers from the Reflection kit. I made another card too, I wanted this to be different from my first...So I switched to color card stock and die cut the blooms from 4 different shades of yellow. I dont have a huge card stock stash, so finding 4 different shades of just one color is extremely difficult ha! Last but not least I made a layout because this ancient photo has been on my desk for years and I actually have hibiscus flowers in my hair. I thought it would be a good fit. Again, I used papers from the Reflection kit to die cut the flowers and leaves. I added a couple of embellishments here and there, not many mind you, because I felt like those beautiful flowers alone already added plenty of texture and dimension to my page. 1. To celebrate this release, Altenew is giving away a $50 gift certificate to 6 lucky winners! Please leave a comment on the Altenew Card blog and/or Altenew Scrapbook blog by 01/31/2019 for a chance to win. 6 winners will be announced on the Altenew blogs on 02/03/2019! 2. I will also draw a winner to receive a $30 gift certificate! I will announce the winner on 01/31/2019. Comment away!!! Your next stop is the amazing Norine! Zsoka Marko --- YOU ARE HERE! Gorgeous layout! Thanks for sharing your talent! love this release. OMG what an incredible set of gorgeous cards - I am overwhelmed!!! Your "happy heart" card in so pretty. I love the style and design. Great creations. Wonderful creations!! The Hibiscus 3D flowers are fantastic! I love what you created with them especially. Angelique Motif must be one of my preferred sets in this release and your two cards featuring that set are both lovely, Zsoka. Thanks for sharing. They are gorgeous. Stunning! Love all those gorgeous hearts! The flowers are so lovely. Thanks for sharing your talent! Wow! I can see why you said you'd keep your comments short as you've been super busy creating. You've showcased so many products from this huge release & my two favourites are the first card & your scrapbook layout. Wow, wonderful array of beautiful cards and layout!! I'm really loving this new release, and this blog hop has given me so much inspiration. Thank you for sharing your talent! All of your cards are so beautiful I can't pick just one! These flower dies are truly beautiful. Everyone’s designs using the are wonderful!!! Oh, those layered hibiscus! I can't wait to get them. On the first hibiscus card was the paper patterned or did you color it in some way to get the variations? It adds such a wonderful shading just like real flowers would have. Genius! Wonderful cards - I especially adore those two shaker cards. Beautiful!! So many beautiful and creative projects!! Love the Radial Hearts cover die. I love the designs of your projects! I can't pick a favorite! Every time I think I have enough flower stamp sets, along comes a release like this one! Thanks for your wonderful cards and a scrapbook page. We don't see enough scrapbook layouts. I think the Garden Picks die set is my favorite. Eye candy galore!!! I love what you've done with that layout. So beautiful! You've done those layering dies so much justice! Gorgeous! I love all the pinks you used. Zsoka! Just wonderful projects... I also love your use of the patterned papers for your die cuts! This new release is so inspiring and all along the blog hop there are wonderful cards and projects such as yours. Thanks for sharing. The radiating hearts is my FAVORITE! But the way you put together the flower dies is BRILLIANT! Love the colors! 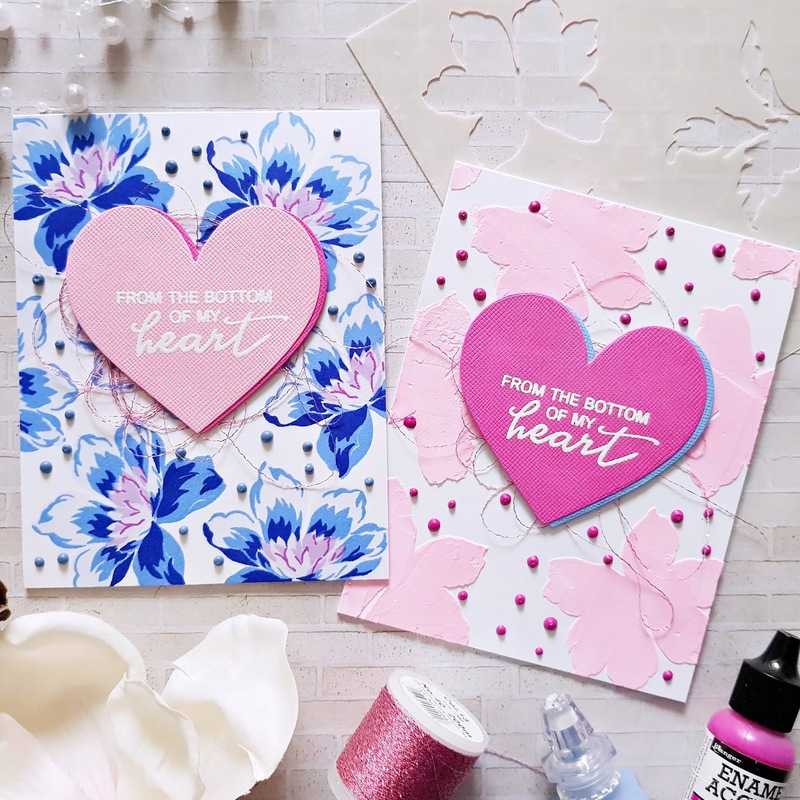 Gorgeous projects Zsoka, love the bold 3d hibiscus and the radiating hearts cover die! Thanks for the inspiration! Very pretty cards...thank you so much for sharing them today.....great new release!! Beautifully done! What a great release and you showed it off fantastically! Beautiful colors on all the cards! Everything looks great..the layering cards, the colors!! Great work! Love the orange and pink Valentines' cards. Your layout is beautiful! Gorgeous designs. I love how realistic & colorful your Hibiscus flowers are. I just love the papers you chose for the inlay on the heart cover plate, and those hibiscus flowers are just wow!!! Oh my goodness Zsoka!!! Your cards and layout are amazing :) Thank you sooooooo much for sharing them!!! Great designs and so nice colours! Thank you for the inspiration!!! Beautiful cards and page, love all the hearts, flowers and wonderful designs! 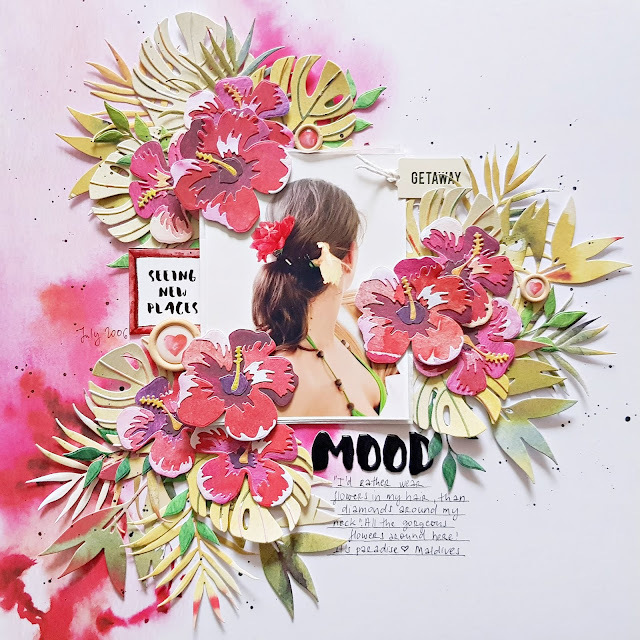 Your scrapbook layout is gorgeous! I love the pinks and purples you mixed to create it. Your cards are stunning. Thanks for the inspiration. Zsoka, your cards and the layout are incredibly beautiful! I absolutely LOVE the Hibiscus 3D die! It's my favorite product in the new release (that and the Bloom & Bud set!) Altenew has out done themselves! Such amazing products in this release! There goes my money!!! Your cards are layout are all just gorgeous! I love your use of colour! Thanks so much for sharing and inspiring us! Gorgeous cards! I especially love the Valentine inspired ones---so gorgeous! So much gorgeous inspiration here! I love the paper piecing in the heart cover die - very time consuming, but totally worth it! So beautiful. Love the dimension. Your use of some of the products from this Altenew release is just amazing. Love the 3D dies and your cards using them are just beautiful. Love all your cards, my fav are the Hibiscus cards and layouts! I love in a snow zone (NH) and seeing these I am transported to a tropical isle! Loving all your color choices. Will have to get this set eventually, a long with the new rose layered set! Thanks for being part of the hop! Awesome Release! Great projects, I especially love the shaker cards! So many wonderful and sweet cards, but that layout just blew me away! Simply stunning! Your Radial Heart is the first example that I have seen yet. Beautifully done. All your examples are beautiful but I really love the hibiscus layout. Your projects just make me feel happy. I think it's all your colors! Great work. Thanks for sharing your talent with us! Lots of amazing creation. So pretty cheerful cards . Love that hibiscus die and it is perfect for so many layouts I've seen on this hop. I love your card with it too. Very striking colors. A treasure of valentine cards! And then my favorite, the hibiscus! Nicely designed, I pinned them all!! Those hibiscus seem watercolors, they're so beautiful! 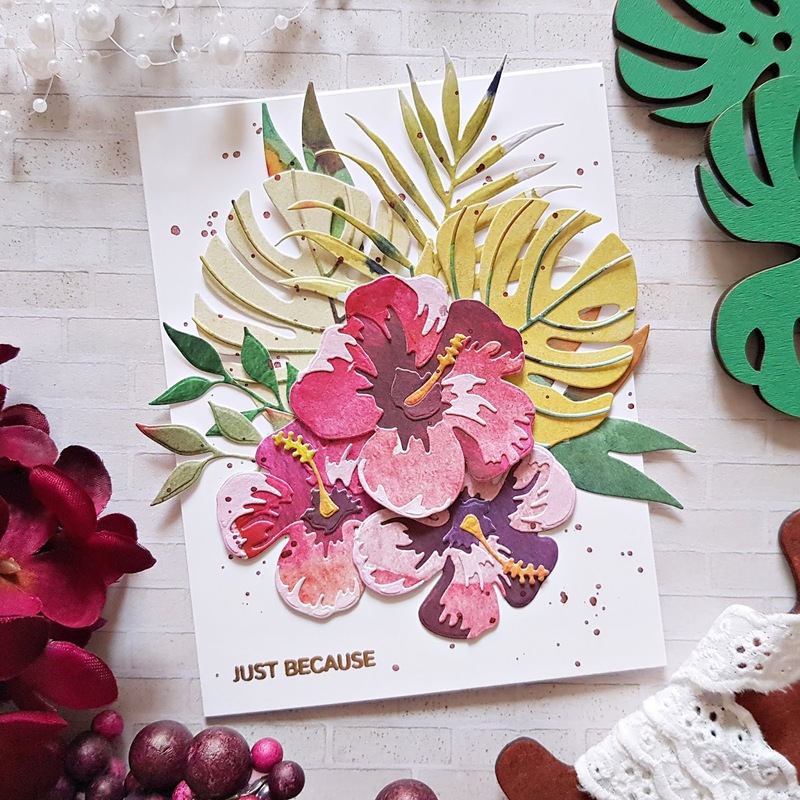 i'm in love with the hibiscus dies and your cards using them are so gorgeous!! Really am liking the layered die sets. I have used some previous ones so I am used them and can't wait to add to that collection. 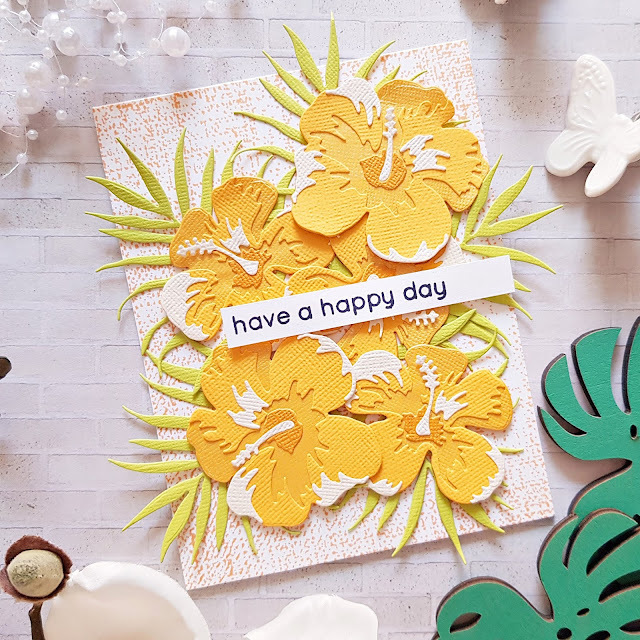 These are all so beautiful Zsoka, the yellow Hibiscus card is really gorgeous as is your layout. Well done. So many stunning cards! Some of my favs are the shaker cards and the ones using the Hibiscus 3-D dies (love how they hand over the edge). And your layout is amazingly beautiful! I love the Radial Heart dies. Can't wait to try them myself. Your cards are so dynamic. Lovely job. Thanks for sharing! Awesome cards and beautiful layout, thanks for sharing! Wow, such fantastic projects! I love the shaker cards! I LOVE your tropical vibes with these cards! They are so lush and I love those great big leaves! These are all son fresh and fun, and so perfect for summer! 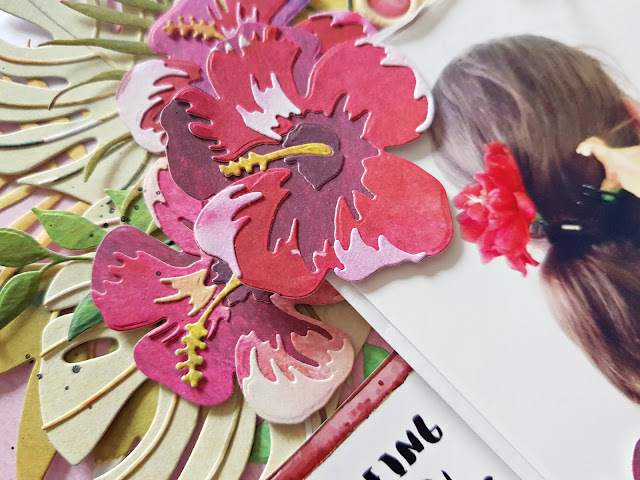 Beautiful cards, all of them and the layout page with the hibiscus is stunningly gorgeous! Pretty variety of cards you have created. So much beauty on your cards and layout!! Love everything!! Wow!! Your cards are spectacular!! 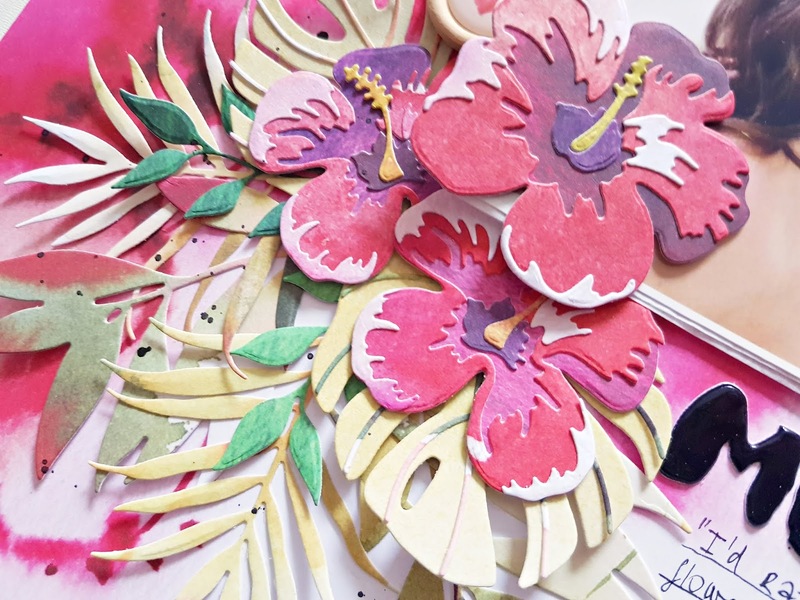 I love your Hibiscus cards the best but I'm a tropical gal in my heart! They are so dreamy!! I feel that Caribbean feel when I look at them. Great job!! Beautiful cards, gorgious layout! I am so in love with those palm leaves and hibiscus flowers they are looking so good in any colour! Wonderful! I like the way you pieced the hearts back in the Radial Hearts die card. Even though I don't usually reach for purple I love the purple and orange combo on your All the Hearts card. Beautiful work! Thanks for sharing. Love all your cards. Beautiful!!! Your cards are so gorgeous! I love the heart ones. My favourite are the Stained Glass window cards. They are absolutely gorgeous. I also love all the projects with the 3D dies. They look very interesting! Your hibiscus card is amazing. The great colors you chose were unique and gave it a little vintage feel. Love love love it! Gorgeous projects. The Hibiscus layering set it my favorite from this fantastic release and you've showcased it beautifully. Nice job on each of these. Love all your beautiful bright colored layout & cards!! Everything is gorgeous! The pink/purple hibscus card...took my breath away! The flowers! The hearts! Just wonderful! Wow! I love all of your creations! Your layout is especially beautiful! Thanks for all the wonderful inspiration! All the Hearts is totally taken over my heart! Such cute cards! so much beauty!!! luv the shakers with just the paper hearts. so cute! Gorgeous cards -such pretty images and colors!!! Thanks for sharing!!! I love your color choices for everything! Gorgeous cards! Your Radial Heart card is amazing! And those gorgeous hibiscus flowers look fabulous! I don't know where to start! Everything is gorgeous!! 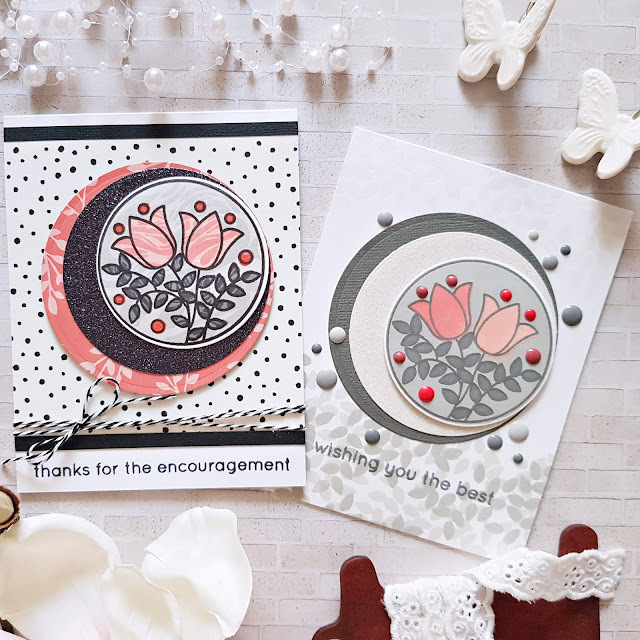 You started out with two of my favorites in the Radial Heart Cover Die card and the Angelique Motif card. I love hearts and flowers. Maybe because my parents were married on Valentine's Day and were married for 55 years! The stained glass cards are also so pretty. I liked the design in all of your cards, but the hibiscus cards and layout are my favorite! They are beautiful and I can't wait to try to create the same look! Thank you for so much inspiration!! Your cards are all so beautiful.....and your layout is stunning! I love that hibiscus layout! Beautiful! TFS! What lovely valentine cards and your layout is stunning! Thanks for sharing! These 3D flowers look absolutely amazing - must be fun to put together. Your samples are all lovely Zsoka! Beautiful, bright, sweet and happy cards! And the scrapbook layouts - stunning! Such gorgeous colors and layer upon layer of amazing elements. Wow! You have outdone yourself with these new items! I love how you 'twinned' your cards! Great contrast and similarities....all so beautiful! I really loved the last set with the hibiscus, one of the sets I didn't buy this time because I have the older hibiscus set. But now I know I will need the new one.....the leaves alone are so awesome. Your page rocks! Thanks for all the inspiration! Gorgeous projects! I love the cards you made, especially those using the Angelique and Stained Glass stamps. I like that you use a lot of patterned paper in your projects. I used to all the time and I need to start doing that again. Thanks for the inspiration! Wow....busy lady! All of your cards were great....I have a soft spot for shaker cards...so the Heart shaker was my favorite...thank you so much for sharing your lovely work. Thank you for sharing your gorgeous creations! Totally inspired to go play in my studio! Wow! What beautiful cards. One of the things that makes these cards so amazing is your color choices. Every single card is an explosion of color. Thanks for the inspiration! So much to love! My favs are the 3d flowers... especially on that gorgeous tropical layout!! Wonderful cards and layout. 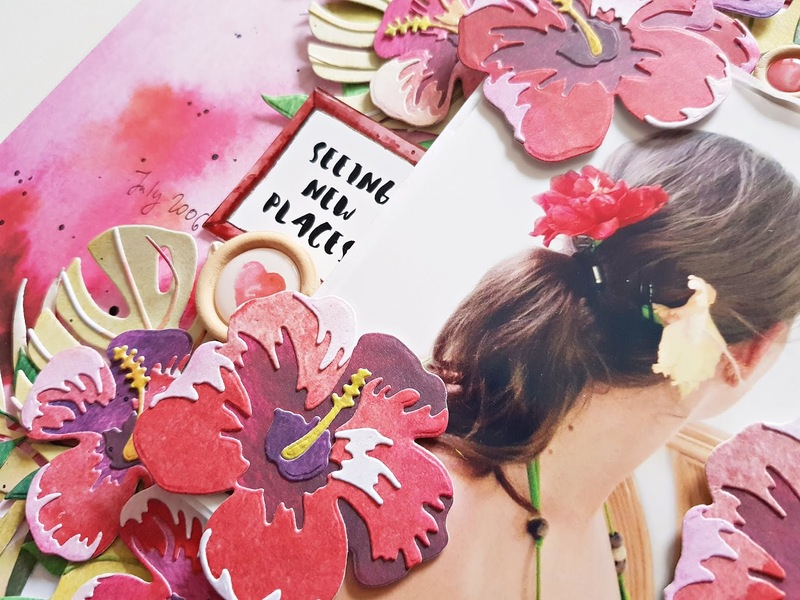 You created pure magic with the hibiscus 3D dies, all of those projects are gorgeous! Gorgeous creations!! Love the Hibiscus designs especially! Just gorgeous work! Thank you for sharing your creative takes on this beautiful new release. Wow. Amazing cards. The 3D flowers look like a lot of fun to play with. Your cards are so beautiful. I love the use of the Radial Hearts Cover Die. Made me smile.